I really got lucky in the mom department, must've come into this world saying, "Okay God, but whatever happens make sure I've got lots of mom-types around." 4 for 1 is a pretty good deal for just about anything. In fact, it's hard to think of many 4 for 1 deals that truly exist, but it does for me. Let me explain. First of all, I was blessed to be birthed by my Mom, Kaye. She always took exceptional care of me (and sister, Mindy) even though it wasn't easy being a single mom for much of that time. While the money wasn't always flowing as well as it could have, there was never a shortage of love and support, which is clearly why I turned out to be so wonderful. I also got lucky with a 2nd Mom. Jeannie, my step-Mom, married my dad about 3 years after my folks divorced and went separate ways. At the time, Dad and Jeannie didn't have kids yet, and so Mindy and I were thrust upon her every summer during our childhood through teen years. Of course it was a major challenge for Jeannie to have to deal with us, especially because we were rather wild and carefree and often took the emotional difficulties of the divorce out on her. But Jeannie did a great job and was a blessing as a 2nd Mom for me and continues to be to this day. Looking forward to seeing her soon. 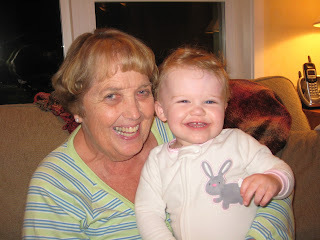 This is a picture of a lucky granddaughter, Nola, with her GrandMa who continues to share the love with the next generation. Thanks, Jeannie! Then there was my sister, Mindy, filling in part time as a mom. She was 3 years older, and since we were often on our own at very young ages, Mindy took care of me when no one else was around. We endured cross-country flights twice a year at very young ages to spend time with each parent, but during those flights and transition periods at the next home, Mindy was often the person I needed for support. In a similar vein, we moved homes quite often when I was a child, 6 different houses and 3 states by the time I was 10. Thankfully, Mindy was always there to help and now is a great mom to her own kids, Mollie and Adam. Finally, there's the wonderful mom I see everyday, my wife, Jana. She's my best friend, my daily partner and companion, and she's also the greatest mom to our beautiful daughters, Shelby and Devan, who (trust me) know how truly blessed they are to have Jana in their lives. And even though Jana is my wife, she often mentions how terrific it is that I'm really one of the children and how I help spread the need for her mom skills to yet another child in the family. Aw shucks, honey, just doing what I can to help out. Thanks so much to all the Mom's in my life! You've really made a difference and continue to today. I love you.